Should you Fit a Kitchen in your Basement? Home > Basement Uses > Should you Fit a Kitchen in your Basement? Basements are a great place to put your inner chef to practice and a great idea for basement use. The setting could not be more perfect for a kitchen, you have privacy, lots of space and your own little hideaway to practice all those recipes. Basement kitchens do not need to be secluded though, while they might offer privacy you can also take advantage of the space they have to offer and create your very own kitchen/diner to entertain all of your friends. The way basements are build makes kitchens ideal for basement use, kitchens require adequate support from the flooring, which basements are able to provide. Basement floors will often be made out of concrete, so they can provide good support for any heavy equipment that you will need to put on it, such as a washing machine or fridge freezer. They will also keep in the noise so you can set your dishwasher and washing machine to full speed and not have to worry about disturbing the rest of the house. Your basement is close to your drainage system so you won’t have to worry about the drainage from your sink as this can run directly through your basement wall and through into your drain outside, which you will need to consider when you think about your basement use. Having good ventilation is a must for any kitchen, the last thing you want is to be smelling last week’s curry for a month, so it is important you allow for a ventilation hole in the side of your basement to let out any unwanted smells and condensation. Ventilation should not be a problem in a basement conversion as your basement kitchen should have at least one wall which has nothing but open air behind it. Gas and electricity points will be within easy access in your basement use and you may even choose to hide your boiler in one of your kitchen cupboards. 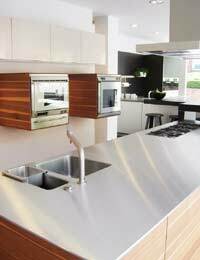 It is a lot easier to build downwards when designing a kitchen, as you have more access to pipes and electrical wires.Whether you want a fitted kitchen or you fancy building one yourself for your basement design, you should quite easily be able to construct the kitchen in your basement which will cause little disruption to the rest of your house. There are very few reasons why basements cannot be adapted to make ideal kitchens, but there are a few potential risks that are worth considering. Basements are a great place to convert into a kitchen, but they do have a few drawbacks. Historically basements do not have a great track record when it comes to flooding. A flood in a bedroom is one thing, but a flood in your basement kitchen could cost you thousands of pounds to put right. You will be putting all of your expensive appliances, your cooker, and your dishwasher, all in the one room that is most likely to get flooded. This should not be a problem though if you cater for this in your basement design and make sure your basement is adequately waterproofed. You will also need to think about any potential fire hazards with placing your kitchen in your basement. Most house fires are caused in kitchens, so you will need to make sure that you have an escape route in case of a fire. It will not be enough to use the main stairs into the basement as your escape route, you will need to build a different way of exiting your basement. Basement kitchens are a great way to use the space you have to create a larger and more welcoming kitchen. You will have the freedom of being able to create your own kitchen that will secluded from the rest of the house. You can host dinner parties, cook until your heart is content, or merely sit back and relax in your basement kitchen. Proper planning is essential when considering basement use, as long as you follow building regulations and safety guidelines there should be no reason you can’t create your very own culinary masterpiece in your basement.